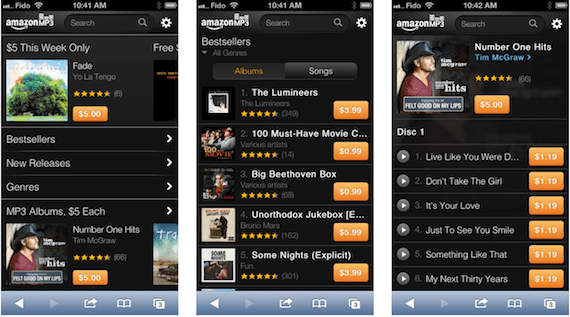 Amazon has announced that its Amazon MP3 store has been optimized for the iPhone and iPod touch. For the first time, users of iPhone and iPod touch can discover and buy digital music catalog of songs from Amazon which has 22 million songs with the Safari browser. Customers also have access to favorite features of Amazon as recommendations, bestseller lists and customer ratings. Music purchases are automatically stored in libraries customers, Cloud Player and can be downloaded or played instantly from any iPhone, iPod touch, iPad or any other device platform. "Since the launch of the Amazon Cloud Player application for the iPhone and iPod touch, as requested by customers was the ability to buy music from Amazon directly from their devices. For the first time, iOS users have a way to do that, now can access the massive catalog of music from Amazon features like personalized recommendations, offers like $ 5 albums, songs for $ 0.69 and can buy their music once and use it everywhere, "said Steve Boom, senior vice president of Amazon Music. ● The website Amazon MP3 Mobile for iPhone and iPod touch is based on HTML5, which means that customers can make purchases directly from the Amazon website mobile MP3 www.amazon.com/mp3 on their iPhones and iPod touch . ● Selection of over 22 million songs and more than two million albums. ● Access to daily deals and $ 5 albums, songs for $ 0.69, free songs from artists promotion. ● individualized recommendations based on purchase history. ● Immediately available and perfect reproduction of shopping on Amazon Cloud Player application. ● Free storage of all Amazon MP3 purchases from Amazon Cloud Player. Movement by Amazon to sell their music without having to create an application in the App Store and make the very strong competition to iTunes Store. You can navigate in the direction http://www.amazon.com/mp3 and take a look. Article The Amazon MP3 store is optimized for iPhone has been originally published in News iPhone .